Today’s Art Challenge entry — a necklace. Fire on Water is a fused glass pendant by a Vancouver Island glass artist. The dichroic colours are so rich. All it needed was a simple chain to complete the look. Categories: Handcrafted Jewelry, Necklaces | Tags: Art Challenge, chain, fused glass | Permalink. Friend and artist Judi Martinez nominated me for the Create 5 Art Challenge. The idea is to produce a new piece of art each day for 5 days, posting it on FaceBook or your blog or website as you go. 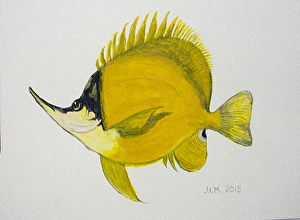 Here’s one of the cute little fish she’s painting as part of her challenge. You can find her other Art Challenge pieces here. Judi isn’t too sure where all this started — but I need a push right now, so I accepted. It’s sort of like a chain letter, without the dire threats of damnation if you fail to pass it on. Here’s today’s effort — Ball & Chain. Okay. You don’t know it, but I started this piece about 2 years ago. Since then it has sat on the shelf above my computer. I’d occasionally look at it, I mean really look at it, and think, Well, it shouldn’t be too hard to finish. I should just do it. Then of course, I wouldn’t. Today. I. Did. Finish. It. Categories: Handcrafted Jewelry, Metal, Ornament Covers | Tags: Art Challenge, chain, freshwater pearls, glass ball | Permalink. There’s a great outdoor Art Show & Sale coming up on August 24 & 25 in Sundre AB. The show runs from 10 to 5 both days and features several local artists. There will be an interesting mix of art including pottery, paintings, woodwork and jewelry. Organizer David Todd is hosting the show on the front lawn of his business, Otter Rafting Adventures. During the summer David runs successful white water rafting trips on the Red Deer River. During the winter — and in his spare hours other times — he runs Otter Pottery. The annual Sundre Pro Rodeo — which was postponed because of the flooding in June — is also running this weekend. It’s going to be lots of fun — hope you can join us! Categories: Events | Tags: art show, artists, beadweaving, chain, stone | Permalink. Simple says it all with this necklace and earring set. The figaro chain and brightly coloured beads make a pleasing combination that could go casual or dressy. The glass beads are hung on silver-plated chain and ear wires. The necklace is adjustable with a handmade S-clasp. Categories: Earrings, Necklaces | Tags: beads, chain, necklace earring set | Permalink. Sometimes less really is more. This necklace and earring set has few components but it has an elegant look. The necklace has a spring clasp. Small jump rings join the two strands at the front. Light coming through the amber-coloured beads creates a warm glow. Categories: Earrings, Necklaces | Tags: chain, drop beads, necklace earring set | Permalink. How long did it take you to make that necklace? That’s a question I’m often asked. And one I’m often at a loss to answer. Take this piece, for example. I found the carnelian beads and the large focal bead about three years ago in Arizona. Didn’t know what I would do with them but I loved the smooth feel and the deep rich colour. Forward a year. I kept bringing out the beads, trying this, trying that, but nothing appealed to me. Skip ahead another year. Aha! Some gorgeous dyed freshwater pearls caught my eye in a bead store and I brought them home. Late last summer I made wrapped loops on several of the pearls, then strung them and the carnelian beads on 20 gauge wire. Lookin’ good. Now what? I tried several ideas but got stuck. Again. Now we’re back in real time, early September of this year. I had a big show coming up and I wanted a stand-out piece. I pulled out some gold chain and arranged it around the centrepiece. Whoo-hoo! I’d finally found the design I was looking for. The design and colour also appealed to a young woman at the show. She approached me early in the evening and asked about the piece, wondering what story lay behind it. I explained how it came to be. She thanked me and walked away. Over the next few hours I saw her walk by several times but she didn’t stop. Others expressed interest but the necklace remained unsold. Toward the end of the evening the young woman who had asked about the backstory returned. Within moments she bought the necklace. I was delighted it was going to someone who was obviously enthralled with her purchase. So, how long did it take me to make this piece? 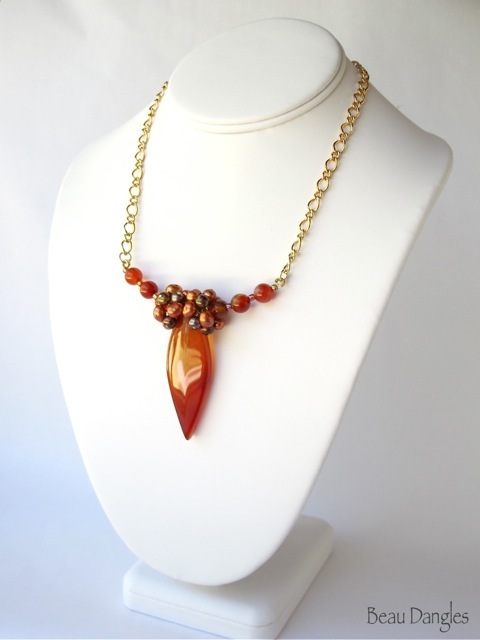 Categories: Necklaces | Tags: backstory, carnelian, chain, freshwater pearls | Permalink. Creativity is a funny duck. This week it began with a spurt of domesticity. I discovered several boxes of stuff that had been languishing under the bed. Among the “treasures” was a very old bracelet, once a favourite but forgotten for many years. As soon as I saw it I began to think about taking it apart. And so I did. Six filigree brass elements each with a red-black centrepiece. Now what? I headed off to my work room in search of some chain and a clasp, all thoughts of vacuuming gone. Within minutes Dragon Eye appeared. It just seemed to flow, as if the bracelet had simply been biding its time, waiting for me to remember. Four of the six segments became earrings. Next came a three-strand chain necklace. I tried for several hours to work the last piece of the bracelet into this design. I tried wire. I tried jump rings. I tried placing it on the side, on the bottom, even as part of the clasp. I tried everything I could think of but alas nothing worked. So the chain necklace is unadorned and the final piece of bracelet remains for another day. As for Dragon Eye, it has already gone to a new home in Calgary. It sold yesterday at our local farmers’ market. 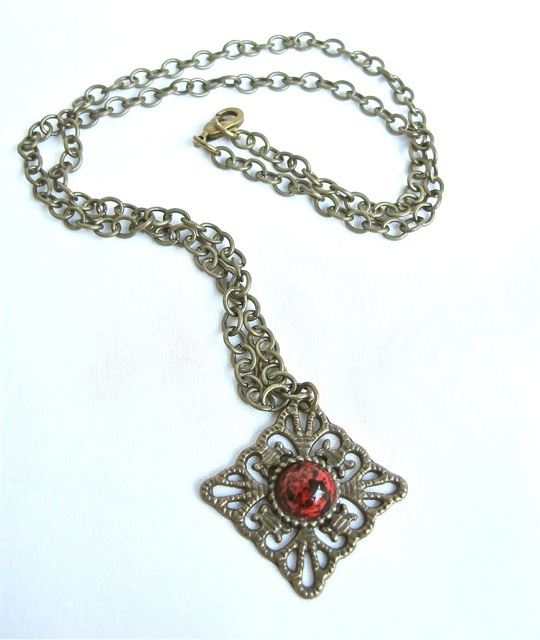 Categories: Necklaces | Tags: chain, repurposed | Permalink. I had fun with this piece. 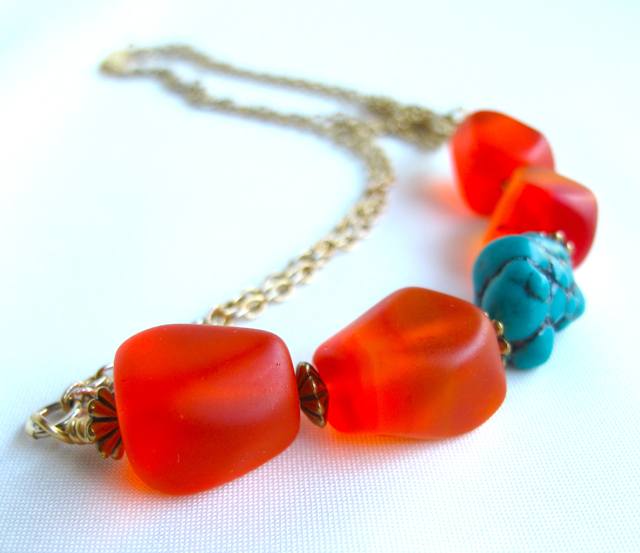 Strung frosted orange glass beads and a chunk of faux turquoise on heavy wire — then bent the wire to form a slight curve. Finished off the design with a double chain and a pillow clasp. Categories: Necklaces | Tags: chain, frosted glass | Permalink.